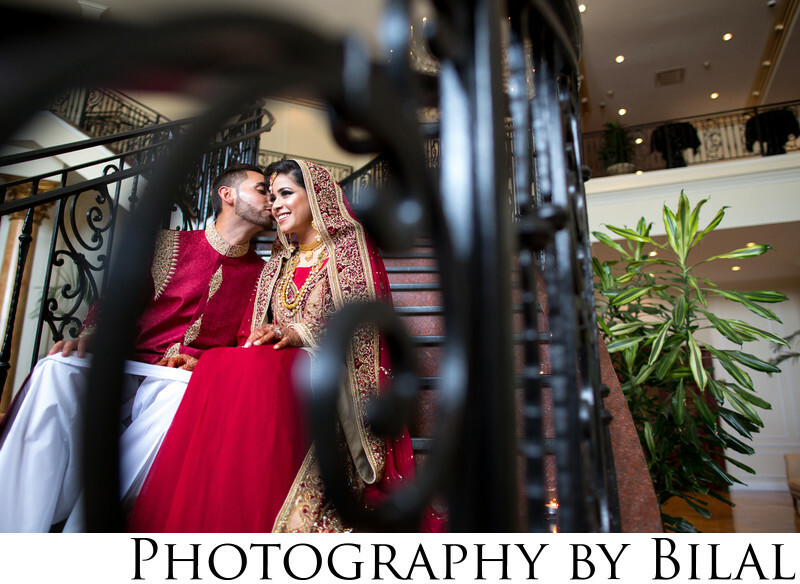 If you're searching for the best NJ Pakistani wedding photographer, then please take a look at my portfolio and decide for yourself. My style is not boring, or traditional, so if you're looking for the same cookie cutter images, you will not find that with me. My style is unique, contemporary, natural, with a touch of high fashion and fine art. Look at this image for example. I would not label this as a very traditional image, I like to use the environment to my advantage to create a frame for my subjects. In this image, I used the railing on the stairway to frame a happy moment between the bride and groom. A skilled and experienced photographer also has to know how to make an image like this work. You can't just pick up any camera and create an image like this. The skilled photographer knows at what focal length the image should be shot at, as well as what the camera settings should be, and lastly, how much lighting to apply and how to apply it to make it look it's best. That is no easy job. There are some that do not value photography and do not understand that a lot of factors come into play in creating beautiful images. It does take a lot of hard work and dedication to the craft to be able to reach a higher level in the wedding photography field. Location: 1301 US-130, Cinnaminson, NJ 08077.